I came home in the sunshine earlier this week to a crimson welcome, and the green shoots of new life in the propagator. The Tulip ‘Negrita’ bulbs that I planted last year have overwintered and spent the last few weeks throwing lush, waxy-looking, green leaves and stems skywards. 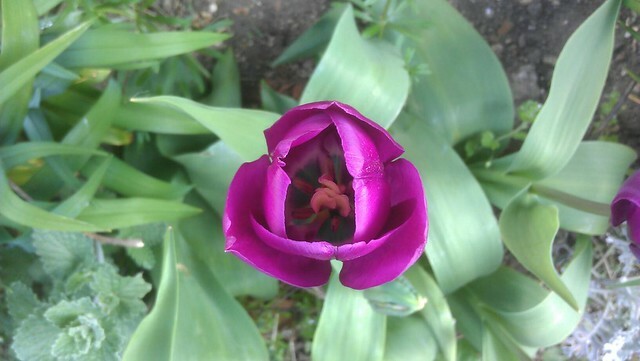 Now I have been rewarded with their beautiful blooms. There were about 10 bulbs and they seem to all be present and happy..
Tip-toe through the tulips (nepeta and a nettle) with me. However, I also stumbled across a terrible thing, and it comes as somewhat of an absent-mindedness confession, of which I’m not really happy with myself about – it looks like i might have forgotten to plant ANY of the beautiful cream and green lacy Tulip ‘Madonna’ bulbs. I found bag of them on my bench. There was a bit of a hole in the bag – so i *might* have planted a few, but there’s no sign of them yet. 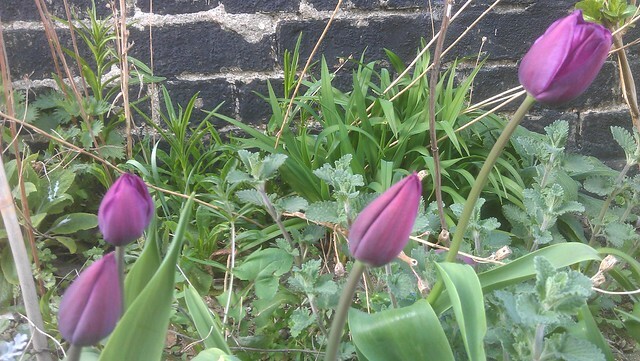 As for the bulbs in the bag – they looked quite dried up, but i’ve planted them out anyway and now they have two chances. They’ll be massively behind for this year though – which makes me annoyed with myself. The seeds that I sowed at the beginning of the month are doing pretty well. Both Courgette ‘Black Beauty’ seeds are now sturdy seedlings, there are 5 Tomato ‘Minibel’ seedlings, and 1.1 of the Sweet Pea ‘Candy Cane’ seeds have germinated. 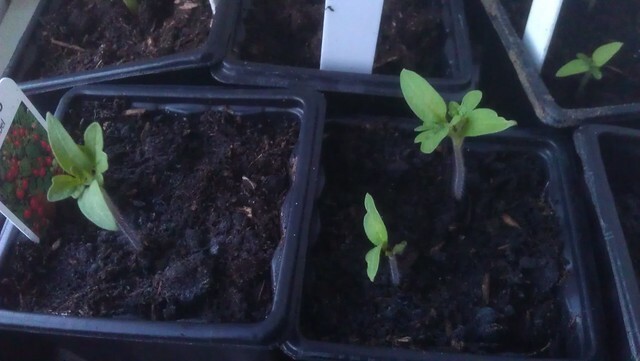 The Tomato ‘Minibel’ seedlings are doing well in the propagator. Add to this, the Parsley ‘Laura’ (a delicious flat-leaf variety that’s great with mushrooms, scrambled egg, or as a salad leaf) is thriving. With the sunshine out, it finally feels like summer is lurking just off the horizon somewhere.